Need more information about booking Home 28395 ? The villa is on Latchi beach and only a 10 minute walk from the picturesque harbour of Latchi. 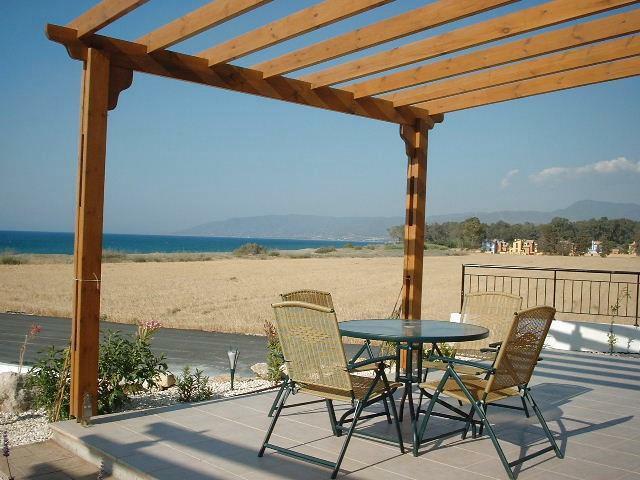 As you can see from the pictures the villa really is beachside and offers fantastic sea views. Situated in a quiet location yet within easy reach of both Latchi and Polis, the property is well equipped, with a modern fitted kitchen and features its own private swimming pool and outdoor veranda with great views. Bedrooms: 1 x King Size room with patio doors to veranda with stunning sea views; 1 x twin room with door to patio and pool area - pool and sea views. Both bedrooms have ample wardrobe space with hangers and come fitted with air conditioning - a must for those hot Cyprus nights Bed linen is supplied. Iron and ironing board in bedroom 2. Living/dining space: 2 sofas to relax on and soak up those lovely sea views. TV with a small selection of English speaking channels and a DVD player. The villa is a bungalow style - all on one floor - which is ideal for the elderly and young alike! Private pool with 4 sun loungers, outside shower, with Roman steps to make entering and exiting easier. The pool is maintained once a week in low season and twice weekly in high season. Veranda with table and four chairs, and breathtaking sea views. This Villa has 2 bedrooms, 1 bathroom and sleeps 4. It’s been listed on Holiday Lettings since 22 May 2007. Located in Latchi, it has 3 reviews with an overall rating of 4.5. The average weekly rate is £1088. The Owner has a response rate of 94% and the property’s calendar was last updated on 01 Apr 2019. You can get in touch with Stuart (the owner) through the contact form on this page. Send Stuart (the owner) an email through the contact form on this page. Alternatively, if there’s a phone number on this page, you can call them. How do I contact Stuart (the owner)? If you’ve already booked, go to Manage your holiday booking to view Stuart the owner's contact details or send them a message. Or send Stuart (the owner) an enquiry through the Contact the owner/manager form if you’d like a quote or more info first. When you pay online through the Book your stay form, a booking request is sent to Stuart (the owner). You’ll find out within 24 hours whether they’ve accepted - no money will leave your account before then. You can also request a quote from Stuart (the owner) through the contact form. The owner will email you the total cost for your dates and a link to book and pay online. Use the Book your stay form to pay provisionally online. You can pay by credit/debit card or PayPal. Stuart (the owner) will have 24 hours to accept the booking and no money will leave your account before then. Why can't I call Stuart (the owner) before booking? You’ll need to contact Stuart (the owner) to do this. Send them a message in Manage your holiday booking or through the contact form on this page. You can request to change the dates or number of people on your booking via the Manage your holiday booking page. To change your holiday dates use the Edit booking button. If you need to change the number of guests staying then send Stuart (the owner) a message. If Stuart (the owner) agrees, they’ll send you a revised quote outlining the changes. You can review and accept/decline this from the Manage your holiday booking page. You’ll have 48 hours to take action before the revised quote expires.